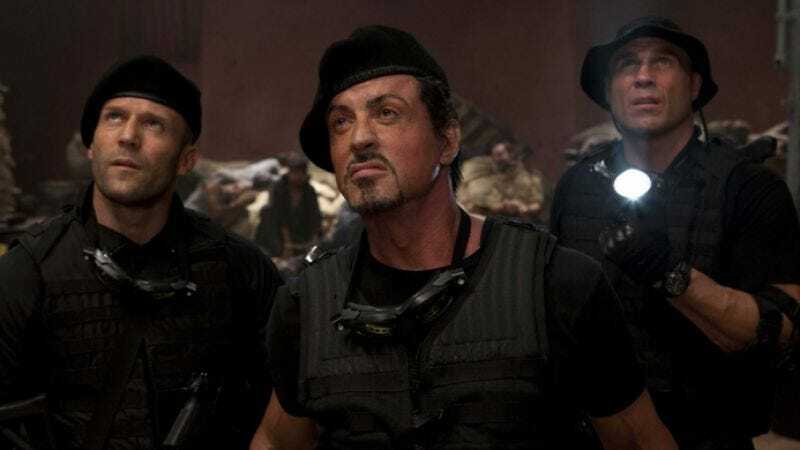 Despite the fact that everyone knows The Expendables was synthesized by a supercomputer that stayed up really late watching HBO, a man named Marcus Webb is suing Sylvester Stallone for allegedly stealing his original script, The Cordoba Caper, which he says is “strikingly similar and in some places identical” to Stallone’s action movie guys’ night out. Webb claims that he first registered The Cordoba Caper as both a short story and a screenplay in 2006 before making it “widely available” to potential investors within the movie industry until 2009. Within that time frame, Webb contends that Stallone and/or Expendables co-writer David Callahan must have seen it and lifted various elements from it for their movie—including certain wholesale characters and plot points, such as the main story about a mission undertaken by a group of elite mercenaries to overthrow an evil Latin American dictator named General Garza, as well as an opening scene involving a hostage rescue at sea that “has nothing to do with the main plot.” Webb is seeking unspecified damages for copyright infringement as well as a court order preventing any further infringement in the upcoming sequel. It’s not the first time Stallone has been accused of plagiarism, of course: Boxer Chuck Wepner famously sued Stallone for failing to compensate him properly for dramatizing his life story to make Rocky, a case that eventually settled out of court. And Staying Alive, obviously, was a total rip-off of Charles Dickens. Anyway, while Webb’s story doesn’t include a dozen aging former action stars doing the film equivalent of doing some really loud bench-pressing in front of all the young hotshots at Gold’s Gym, the rest is certainly condemning. Stallone has yet to comment, but judging from his (sadly abandoned) Twitter feed, if he did it would probably sound something like, “Truth shadowboxes with itself in the desert, and the vultures come to pick the leftover bones.” Or something.